John Grayson, researching the G4S asylum housing contracts and their impact on the North East, uncovers the latest G4S twist on asylum housing markets – a hostel for asylum seeker mothers and babies in Stockton on Tees. The hostel is contracted to G4S by Jomast Developments, a family property development company empire headed by Stuart Monk, whose family has a personal fortune of £138 million. G4S, the largest private security firm in the world, won part of the UK Border Agency’s (UKBA) asylum housing contract in March 2012. Across the UK, security companies G4S, Serco and Reliance (as part of Clearel Ltd), have obtained contracts possibly worth £600 million over the next five years. These contracts, totally financed from taxpayers, have effectively created a publicly-funded for-profit asylum market. The contracts in Yorkshire are currently a shambles and in chaos, but the people who are really suffering as a consequence, there and in the North East, are those asylum seekers endlessly waiting for outcomes of asylum claims and … their children. In the North East of England, if we look under the carpet of the G4S’ asylum housing contracts, we are standing on a glass floor, through which we can see a world for women asylum seekers and their small children, which even campaigners on asylum rights simply did not believe still existed. 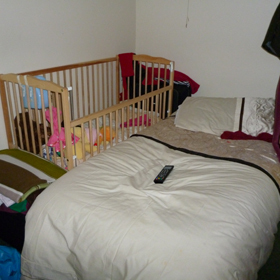 The Stockton Jomast hostel for women asylum seekers and their babies and infants up to the age of two and a half, is very recent, established only in 2010. It resurrects a world of punitive housing which takes us back to the women-only segregated hostels of Kathy Come Home, and the morally charged unmarried-mother-and-baby units local authorities developed in the past. More centrally, it is further evidence of the UK’s barbaric asylum system which routinely damages the health of babies and children. In interviews I undertook with women at the Stockton hostel they constantly returned to phrases about living in ‘cells’, in conditions ‘like a prison’, with no respect for their dignity, privacy or different cultures. Awarding the asylum housing contracts in Yorkshire and the Humber and the North East to prison guard company G4S clearly signalled the UKBA’s ambitions to extend the privatised ‘detention estate’, already managed by G4S and other security companies like Serco. G4S currently manages four UKBA detention centres, including the Cedars ‘family friendly’ detention centre, which gives a cover for the continued detention of children by using the Barnardo’s charity as a partner. G4S also manages seven private prisons, and 675 police and court holding cells throughout Britain. G4S of course also figures in plans to privatise police services. It is ironic, perhaps, that the Stockton Jomast hostel for mothers and babies was previously a ‘police hostel’, part of the criminal justice system. The opening of the G4S Stockton hostel and Home Office policies on asylum seekers, taken together with G4S’s profit seeking, and security-oriented approach, signal the return of attitudes to asylum housing which helped produce Angel Heights. G4S went ‘back to the future’ by reopening on 15 October the detested Angel Lodge (also previously managed by the Angel Group), in the grounds of Wakefield high security prison, as the IA (Initial Accommodation) centre from where new asylum seekers will be dispersed to the North East and Yorkshire. The development and use of the Stockton hostel also reflects the ongoing crisis in the G4S asylum housing contract in the North East and Yorkshire. In Yorkshire, there are simply not enough private rented houses for G4S to contract, and move asylum seekers into. The crisis is also building up in finding housing for an increased flow of asylum seekers, many from the Middle East, needing to be dispersed in the regions. On the first weekend in October, 220 asylum seekers were awaiting dispersal at the IA centres in Barnsley and Huddersfield. G4S won the asylum housing contracts and transport contracts, by offering a cut price contract undercutting councils in Yorkshire. Thus they have only been able to start the contracts ‘on the cheap’ by sacking drivers, contracting houses in poor condition and cutting support services and staff for asylum seekers when they are being moved. In Stockton the core ambitions and values of G4S seem to have meshed with those of a local property development empire, Jomast Developments, headed by Stuart Monk. He and his family have run Jomast as a private group of companies since 1971, currently with a property portfolio approaching £200 million. Stuart Monk is number eleven in the North East’s Rich List with personal family assets of £138 million. He just squeezed into the Sunday Times 2011 500 Rich List at number 465. In 2010, the North East became the only region in the UK to have totally privatised asylum housing with one sole private housing contractor, Jomast. Jomast had taken over previous properties and staff from a failed company called Kimberley, which went into liquidation leaving staff and debts unpaid. Jomast then bid for the extension of the UKBA asylum housing contracts in 2010. It put in a bid which was, according to local campaigners 38 per cent below bids from local authorities and another company, Clearsprings (in other regions a major national player in the new COMPASS asylum housing contracts). Central to this 2010 bid was the Jomast offer to include in the new contract a potentially high-profit asylum hostel, based in a former bail hostel it had bought for redevelopment. Stockton Council and its different departments had waged a campaign to stop any future hostel development throughout 2009 and into 2010, particularly when Jomast put forward the idea of an asylum-seeker mother-and-baby hostel. By July 2010, the Safer Stockton Partnership was receiving reports of the unwelcome development: ‘Members were informed of the changes to the former Police Hostel … Jomast were seeking to open a hostel for asylum seekers for only women and their children. There would be 24 hour cover at the hostel and any visiting would be controlled. It was stated that one family would be taken in each day over the next 11 days, there would be 11 women and 13 children to begin with’. Jomast persuaded the UKBA that such a development was ‘compliant’, in other words it fitted the (very low) standards the UKBA demanded of asylum housing. 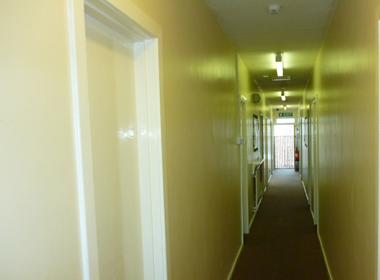 The hostel was also useful in providing places for asylum seekers displaced and moved from Clearsprings asylum housing, mainly in Sunderland. Jomast and its property portfolio, including private rented housing, is still mainly centred in Stockton. It owns very few houses in places like Sunderland and Newcastle. The hostel in Stockton, directly owned by Jomast, would produce more profit than subcontracting from small private landlords in other parts of the North East – following the model of Angel Heights, which had provided its owners with £700,000 of profit before tax in its first two years. When Jomast won the extension contract in 2010, it rapidly filled the hostel. One woman, among the first residents of the hostel, when it was fully occupied, called the regime Jomast attempted to impose on the women repressive. Already in May 2010 the Safe Stockton committee had heard that ‘visiting to the hostel would be controlled’. Why? Perhaps the control over visitors was an attempt to counter the obvious argument that, by concentrating large numbers of women asylum seekers, not only in one area, but actually in one building, it was increasing their vulnerability. This kind of concentration seems to have been avoided by the UKBA in recent years – that is until G4S/Jomast COMPASS negotiations sanctioned this provision for the next five years. Professionals and asylum seekers were also convinced that Jomast was bent on developing a building next door to the hostel as an extension of hostel accommodation, making for an even greater concentration. The Stockton hostel was also situated in an area where street prostitution was prevalent and increasing in 2011 – a fact apparently ignored by the UKBA when it agreed that the hostel could open there. In fact the main motive for Jomast developing the hostel is likely to be simply crude profit, although it is almost impossible to be certain what the commercial contract between Jomast and G4S contains, which would tell us exactly what Jomast will make from the hostel, and of course G4S will ‘top slice’ any profits made by Jomast in the hostel as the private company in charge of the contract. An early resident said that when she first went to the hostel, a curfew had been imposed. They could not leave the hostel until after nine in the morning and had to return by nine at night. She said the women simply refused to cooperate and Jomast withdrew the demand. Even in October 2012, another woman who had taken advantage of the established rule that asylum seekers could be absent from accommodation for up to seven days, was grilled about whom she was visiting and whether her bank account showed evidence of other income or support. 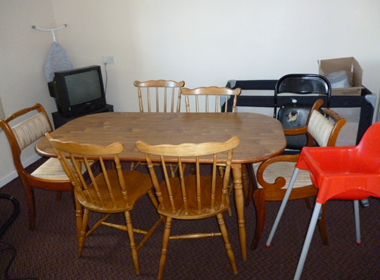 The residents of the hostel are all women and their young children. Yet few women have ever been employed to actually run the place. A popular woman administrator has just been declared redundant in October by Jomast in its cost cutting exercise. A woman cleaner has two hours a day six days a week, a male cleaner has six hours. Jomast has its own security staff who make three exhaustive checks each day in the morning, early evening and at midnight. This process was described by one resident as ‘security noisily tramping down corridors, knocking loudly and entering kitchens, toilet and shower rooms and bathrooms’. The midnight security check apparently wakes babies and children, and one mother said she had never slept properly. Only one of the security staff is a woman. 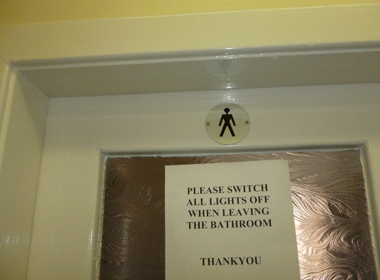 The male cleaner and male security staff enter communal facilities and are said regularly to interrupt women when they are showering and bathing. The individual rooms are oppressively small with space only for beds, cots and storage, and a sink. (See pictures). There is no space for toddlers to play – women open their doors to allow children to cross the corridors to give them a little space. There is no space to store large toys in rooms and they are banned from corridors because they are a fire risk. All buggies are stored in a room downstairs so mothers cannot wheel them on corridors. 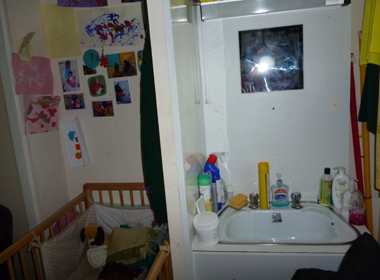 Some children in the hostel have already spent over a year in their tiny rooms. Local statutory services, acutely aware of the effects of this kind of living on mother/child relationships, have encouraged mothers to go to the local Surestart centre and a drop-in facility in the area. The UKBA has, on a number of occasions, seen the hostel regime as ‘compliant’, and Jomast keeps the age limit on children at two and a half years so as to scrape inside Housing Act living space standards. The place feels like a detention facility, and according to residents some women totally break down under the pressure. No thought or respect seems to have been given in UKBA inspections to the reality of the lived traumatic experience of women and children housed there – women who claim to be by definition (quoting the 1951 Refugee Convention) fleeing from their own countries with a well-founded fear of being persecuted for reasons of race, religion, nationality etc. Much of the rest of UK government public policy now rests on the crucial importance of early experience and early learning of children in determining their future … not apparently in Stockton, and not if your mother is an asylum seeker and your landlord is G4S. 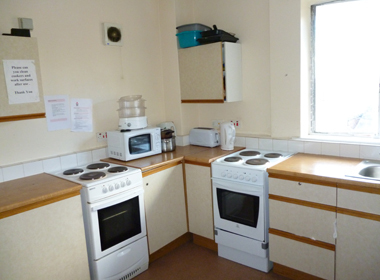 In the Stockton hostel nine mothers and babies share each of the three kitchens. 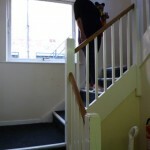 The ground floor kitchen requires mothers to carry hot meals up two flights of steps with babies in their arms (see picture), back to their rooms, if they don’t want to use the small ‘dining area’ with an old table and a mixture of second-hand chairs adjoining one of the kitchens (see picture) or the communal area with its cheap plastic armchairs. 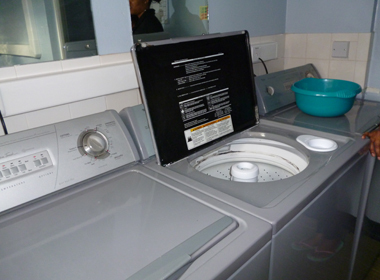 I saw only two washing machines and two dryers in a room on one floor (see picture) which presumably serve either the nine women on that floor, or the thirty women in the building. Another bathroom had two baths side by side, which the women found both puzzling and amusing. Another, with one bath, was obviously used as a drying room for children’s clothes, with hardly any room to move around in. I was told that for much of the time, the smells from storage bins containing used nappies and other material spread throughout the corridors. Local authority officers and professionals in Stockton lost their battle to stop the hostel opening in 2010, but some residents have constantly questioned and challenged the regime imposed by Jomast. One woman who became an advocate for immediate changes was moved out by the UKBA. 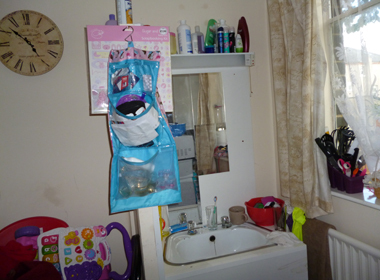 Another woman challenged her ‘no choice’ move to the hostel and worked with a sympathetic local authority officer to defy Jomast and the UKBA, and to get an acceptable home for herself and her child. Other women have linked up with local asylum rights campaigners. Many of the women in the hostel attended a meeting with G4S and UKBA in April. Local asylum support agencies thought they had wrung a concession from G4S in the early summer, that the hostel would not be part of the new five-year COMPASS asylum housing contract, but the hostel contract was signed with Jomast on 1 September. The UKBA did undertake another inspection of the hostel to assess its ‘contract compliance’. Apparently it simply asked for the corridors to be painted before the handover. The place obviously fitted nicely into the Home Office and UKBA’s ‘deterrence’ philosophy of providing the sort of support which would deter asylum seekers from coming to the UK. John Grayson, ‘Another shambles as G4S is entrusted with running asylum seeker housing’, Open Democracy, 9 August 2012. This image of a glass floor was originally an insight from Prof Judith Schklar. ‘Behind closed doors: racism in prisons and detention centres’ CARF (Campaign against Racism and Fascism) Bulletin 56, June/July 2000. See Lorna Gledhill, ‘Bad Management and Broken Promises: asylum housing gets the G4S Olympics experience’, Open Democracy, 15 October 2012. SYMAAG (South Yorkshire Migration and Asylum Action Group), with the notog4syorkshireplus group is actively monitoring and challenging G4S evictions and rehousing of asylum seekers. Details of the campaigning against G4S asylum housing contracts can be found on the website. ‘The North East Life Glitz List’, North East Life, 20 August 2012. Clearsprings has created Clearel Ltd jointly with private security company Reliance, headed by millionaire Conservative Party donor Brian Kingham. Clearel has been awarded the COMPASS asylum housing contracts for London, the South West and Wales for the next five years. Reliance has inherited staff and contracts for escorting deportees from G4S. Jomast is the prime development company for the redevelopment of Stockton town centre. Its latest ventures include a £25 million casino in Stockton, and a 500-bed luxury hotel adjoining the Wynyard golf course which Jomast has bought. Safer Stockton Partnership minutes, 6 July 2010. Knowledge and Inclusion Project, Refugees and Asylum Seekers, Briefing Sheet number 4, December 2005. Download it here (word doc, 262kb). Safer Stockton Partnership minutes, 10 May 2011. A very well done job for exposing what many vulnerable people are expected to live their everday life in such conditions awaiting decision for years from Home Office.This really goes to show that the asylum seekers are not respected.We are all human beings and we deserve respect and dignity. the aim is to break you down so they leave you here for a long time and then UKBA starts bringing you air tickets offering to send you back home. some just accept and their fate when they get back home is unknown and UKBA are happy that whatever happens to you is not on their watch. funny that if a man kept his wife and child in these conditions he could be arrested for domestic violence. am looking at the present interpratation of domestic violence by home office, surely keeping these women in these condition has to be a violent act. Yet another example of the profits over people attitude of G4S and the UKBA! What ever happened to the UN Convention on the ights of the Child that the UK Govt signed up to, ir was that simply a paper excercise? Somehow I think it was! After having known a man housed in Angel Heights I didn’t believe it could get any worse than that. It seems I was wrong, very wrong. An encounter with Jomast management over the moving of another asylum seeker in North Tyneside convinced me that profit is indeed their only concern. When you have baby wait for a punishment ….. To be moved while the baby is two days old, your feet are swollen,got stitches, wound, so much pain in your body,no strength to hold the baby, cook, clean and take care of your self in additional not aplace Ideal for the baby…. No pots, plates, spoons, kitchen utensil, Christmas time holidays no shops,all closed no-one to hear you loud…. It’s A SHAME!!! !